Filed under evernote on January 24, 2015. An effective, and enjoyable, task management system has eluded me for years. My early higher education career was an organizational mess. I relied on my memory for tasks and found myself failing/forgetting regularly. At some point, I began to use Post It Notes. They helped; a bit. Due to some success with this method, it was my system for several years. Into the mid-90s, the personal digital assistant entered into our lives and I found myself intrigued at the possibility of integrating these devices into my workflow. My first attempt was to use an Apple Newton MessagePad; however, because of its heft and expense I would rarely take it out of my office. It became more of a desk assistant than a personal digital assistant (PDA). After about a year of limited use, I sold the Newton and moved to the more pocketable and affordable Palm Zire 72. I liked it and quickly learned the benefits of an electronic reminder/alarm in my coat pocket. I finally began to complete tasks and arrive to meetings on time. While excited about the Palm, I wasn’t using the device regularly and I often failed to sync the Palm with the Mac software as it was, quite frankly, a pain in the neck and often fraught with errors and duplicates. Later the Zire died and I lost my entire ToDo list along with contacts. I lost trust in electronic systems and moved back to paper and pencil. This time instead of Post It notes, I used Moleskine Journals. I missed the reminders and alarms, but didn’t notice changes to my productivity going forward. I was still a mediocre performer. In other words, utilize a system that collects everything so your mind doesn’t have to. Only when you have removed your busy life from your brain and moved it into your trusted system, can you enjoy life while at home and be productive while at work. As I read Allen’s GTD book, I modified some techniques to make it more usable in my world. My belief is that no one system is perfect for anyone; however, the basic tenants of Allen’s GTD system apply to any productive task management system, no matter what shape, form or tool is used. My mediocre higher education career and military careers began to take off as colleagues now considered me to be very organized and impressed in the amount of work I could complete. Adding to the GTD method my Inbox zero process, and I was finally able to go home in the evenings and not think of work, but rather engage in the things at home that I enjoyed. I didn’t need to think about work, because those tasks were in my trusted system and would be there when I arrived the next day. After honing my manual GTD process, I decided to integrate OmniFocus for Mac. GTD lovers online were extolling the virtues of this software and I was intrigued. While OmniFocus is a robust software package true to the GTD methodology, I found myself spending more time managing the system than I did completing tasks. It became entirely too easy for me to lose myself in the features and power. In a nutshell, it became a geeky distraction (like LEDs and squirrels). I reverted back to an oldie, but a goodie, once again – the Moleskine notebook. As you can see above, the page contains data from meetings as well as a list of tasks generated. The journal is a great place to capture all types of data quickly. When I complete a task, I place a diagonal slash through it. Two complete and three incomplete tasks are shown in the image above. You will notice that I also integrate symbology at the end of each task. The @ symbol denotes an email action, a circled ? denotes a research actions, and the ☎ icon denotes a phone call. These are simple symbols to create. Names after these symbols denote the contact. I have other icons to represent other actions, delegates >, and locations not shown on this page; however this gives you a brief sample. I quite like this system and others who view my notes are quizzical. This becomes a good time to share my system in hopes of encouraging them to create their own trusted system. I am very proud of my manual system and it works well for me. It also integrates nicely into my new love of Sketchnotes, as I can sketch during presentations and also captures tasks. As my journals began to fill up, I wanted a way to quickly search old archives. I learned that Evernote accepts scanned pages and makes them searchable by adding an optical character recognition (OCR) layer to the image. I began to experiment with Evernote and found I liked scanning pages for later review and or to search. I wouldn’t scan all pages, only pages with significant resource material. This led to my adoption of Moleskine Evernote Journals. Included with the Evernote branded journals were 3-month premium memberships. Premium features of Evernote caused me to explore Evernote for other uses in my life besides just capturing journal pages. I researched the many ways to use Evernote and quickly became an Evernote junkie. Evernote is now my new trusted system and I archive all my important email messages, documents and thoughts. I even use Evernote use for long form writing. True productivity power came when I learned to use the sharing feature (both notes and online) for team collaboration. I don’t think there is a day that goes by that I don’t either create, send or reference a note within Evernote. Its ubiquity across devices means that I have access to all stuff, all the time. I like that. I found there was one part of my workflow that I did not maintain within Evernote, my task list. These were still in my Notebook which I would review weekly to ensure I had completed all tasks and mark them as done. I just didn’t think to include this within Evernote. Really? Another task management system? After really using Evernote, I’d been itching to try an electronic version of my system again. I like my Moleskine notebook method of capturing and acting on tasks, but this system does not allow for electronic features such as; image collection, sort, search, and reminders. I use Markdown so I decided to give TaskPaper a try. Again, Evernote wasn’t even on my radar for task management. While I like the Markdown syntax used by TaskPaper, it just wasn’t convenient nor easily made ubiquitous with common tools. I had to use different apps on my Mac versus my iOS devices. I also was not able to easily add messages from my Inbox nor did I have alerts based on due dates (tools that Omni Focus provided). What I thought would be very simple due to the nature of the plain text file, became a frustration in task creation, review, action and completion. It didn’t take me long to determine that TaskPaper was a failure for my workflow. I went back to my old standby, my Evernote Moleskine notebook. Then it FINALLY struck me. DELAYED EPIPHANY TIME! I’ve been trying every tool besides the one that I use daily, Evernote. Why not use it as my task management tool? 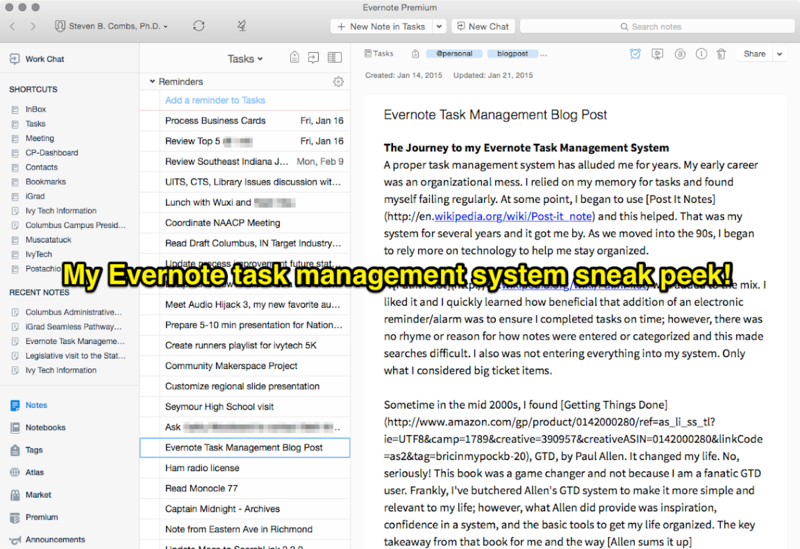 I began to search online and see how others used Evernote to manage their tasks. What I found was a mix of complicated GTD systems to the simplistic single note task list. 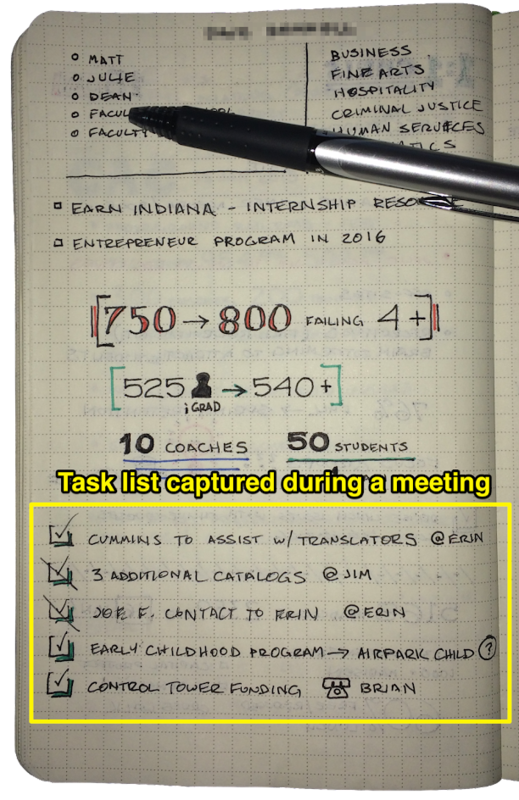 I experimented with the single note task list by transferring my notes from my journal to Evernote. This flat list more resembles my Moleskine notebook workflow. I soon learned that this was not an optimal system as I could not assign a reminder to each task on this list. It was no more effective than my written list. After much experimentation, trial and error, I finally came up with a system I think is just about perfect. A system that provides me with anywhere access, creation, searching, sorting, acting, tagging and reminders. My system even allows me to continue to use my Moleskine notebook so I still have access to paper and pen during meetings to create sketchnotes. A sneak peek is in the image below; however, this image is only the tip of the iceberg and while it may look simplistic, there is a lot of power to my system. Integrating Evernote into my task management workflow has significantly improved my productivity! By now, there is probably a curiosity as to how I use Evernote as my task management system and that, readers, is for another post. I am currently refining and outlining my process for publication. When that post is complete, it will allow you to replicate and/or modify my system to make it your own. It will take some time to complete this documentation, but my hope is that sharing will help others and also help me to refine the process. Be sure to check back for my Evernote Task Management post, or subscribe to the RSS feed. I also announce new posts on my Twitter feed as well as Google+. In the meantime, drop a comment below and tell me about the road to your task management system.